T-Mobile has announced the availability of the Nokia 5230 Ovi Music Unlimited edition – with the phone priced at a penny under £100 on pay as you go. The PAYG offering comes with six months free internet access, unlimited free texts and 12 months access to the Ovi Music Unlimited service from Nokia – if you top up £10 a month. 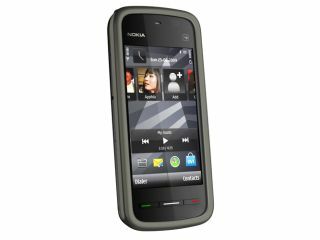 The Nokia 5230 features a 2MP camera, two free games and turn by turn navigation through Ovi Maps. The 3.2 inch touchscreen phone also offers a 2GB memory card, although the slot can take cards up to 16GB. Nicola Shenton, Head of Handset and Device Marketing at T-Mobile UK, said: "The incredibly popular Nokia 5230 is the perfect all-rounder, offering customers a huge range of exclusive benefits all for under £100. "With internet access and music downloads free from the moment you register the phone, the Nokia 5230 Ovi Music Unlimited on T-Mobile makes the perfect fuss-free Christmas gift."